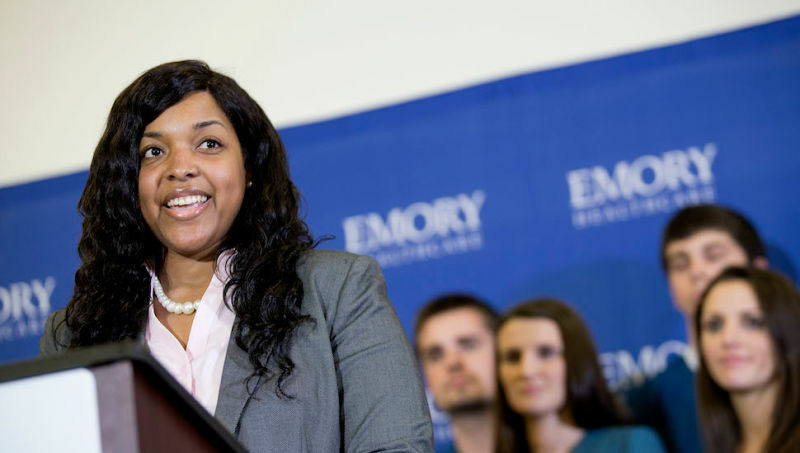 Amber Vinson, the second Texas nurse to contract Ebola last month, is getting better but reportedly lost her engagement ring to the virus. Vinson was first hospitalized on Oct. 14 after treating the first US Ebola patient, Thomas Eric Duncan, who later died. Vinson was released from Emory University's hospital two weeks later after finally testing negative for the disease. Now she's making the press rounds, talking to CNN about her ordeal. It is very draining. And even now, walking a short distance, I get short of breath. When I was going through my very rough days, you have to force yourself to get up and forcing yourself to get up is a struggle. You're fighting for your life. Vinson said many of her belongings were incinerated in the days following her diagnosis. "Your house was sterilized? They burned a lot of your things? They incinerated your engagement ring?" Don Lemon asked on CNN Tonight. "Yes. I was crushed. It's a thing, but it has sentimental value to me," she told Lemon. Lemon also tells Vinson he's cool and all, but she should know that none of the venues contacted by CNN wanted to host her interview because she once had Ebola. Happy recovery Amber, love your friends at CNN!